Paternoster is one of the most popular destinations on the West Coast. It speaks to you through the surrounding nature and silence – the crayfish and hotnosvis, birds, flowers and boulders. Tietiesbaai. The whitewashed fishermen's cottages and the people. In the late 15th century a Portuguese ship was stranded in this small bay. The desperate castaways prayed the Lord’s Prayer out loud – Padre Nosso … - which over the years became Paternoster. Centuries later fishermen cottages started to appear and the crayfish potential was discovered. Crayfish and hotnosvis (hangbergers) have always been part of the character and life of this small fishing village, and angling and crayfish diving are still great attractions. Camping and sea kayaking are also popular. The local hotel, which was built in 1863 and became a hotel in 1940, has been declared a National Monument. The hotel premises used to house the hotel, post office, small school and small prison (now the bar), and farmers used to store their corn in what is now the dance hall. The hotel has since been enlarged and are now without the other buildings. Apart from the hotel, there are also several guest houses, Bed & Breakfast establishments, self-catering chalets and camping facilities available, as well as restaurants, small shops, a superette, fish market, arts and crafts. This 264 hectare nature reserve is situated about 3km west of Paternoster. Tietiesbaai (made famous by Pieter Pieterse) forms part of the nature reserve and is frequented by people who enjoy nature at the sea, campers and caravaners. There are two ablution blocks, without any electricity, with various campsites nestled between the boulders next to or close to the water. There are also many picnic spots and braai facilities. The rocky coastline is ideal for fishing and scuba diving for crayfish. Tietiesbaai also offers some of the best seas for kayaking. This lighthouse, situated within the nature reserve, stands 80m above sea level and is 15m high. It has a lamp with 5 million candle-power which flashes every 15 seconds and can be seen for 32 nautical miles. It is the first lighthouse ships coming from Europe encounters. You can go up into the lighthouse to enjoy a spectacular view – and to try and count the candles! There are also four fully equipped, self-catering houses on the terrain which can be rented. The rocky coastline of Paternoster, and especially Cape Columbine, with its tranquil rocky and kelp waters, is well-known for snorkel diving to catch crayfish. You can search for crayfish under the rocks between the kelp, rock crevices and shelves. It is essential that you wear a protective wetsuit, since the water often are as cold as 10°C. It may only be caught during crayfish season, and a recreational licence is mandatory. A licence can be obtained at the Post Office. It allows you a maximum of four crayfish per day, no smaller than 80mm length across the carapace (backside). Crayfish season usually runs from middle November until end of April. The Beach Camp is situated close to Soldatenbaai in the Cape Columbine Nature Reserve. You camp in A-frame tents with all meals included, and there is a beach bar. It is ideal for adventurous people, and offers snorkeling, scuba diving, crayfish diving, mountain biking, fishing and kayaking. Or lazing in the sun next to the water. The West Coast are known for its wealth of flowers during spring, which can also be experienced at the Cape Columbine Nature Reserve and surrounding areas. Flowers appear on the flats, between the boulders and rocks, even close up to the water. Paternoster has several long, safe hiking routes. One of the well-known routes starts at Tietiesbaai, with the hiking route moving southwards along the coastline, over dune land, fynbos and rocky coast, past Trekoskraal all the way to Swartriet north of Jacobs Bay – a distance of about 17km. Another well-known route starts at Paternoster’s Eerste Mosselbank in a northerly direction, along the beach via Britannia Bay (where it gets rocky again) until you reach Stompneusbaai – a distance of 30km. Large black mussels can be harvested from the rocks. A recreational licence must be obtained from the Post Office, allowing you to harvest 30 mussels per day. 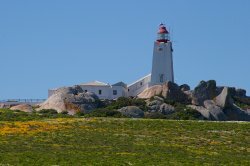 Paternoster and the Cape Columbine Nature Reserve are well-known fishing ground for hotnosvis and galjoen. Hotnosvis are caught throughout the year, while the season for galjoen starts on 1 March and closes 15 October. When the fishing boats return to the beach, you can buy hotnosvis and harders directly from these fishermen. They will even remove the scales. 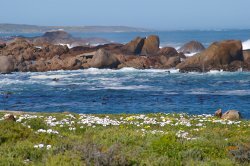 There are two islands with seals in the vicinity of Paternoster: One below the lighthouse, close to Soldatenbaai with approximately 20 000 seals; the other is Seal Island near Britannia Bay, with more than 100 000 seals. These seals can easily be viewed from a small boat or kayak.